We’d love your help. Let us know what’s wrong with this preview of The Lantern of Dern Blackhammer by Lawrence BoarerPitchford. To ask other readers questions about The Lantern of Dern Blackhammer, please sign up. A classic epic tale of adventure with a hint of Tolkien and Conan Doyle. Set in a 19th Century environment where the technology is magic, steam, and water based, our heroes pursue a wizard who is bent on enslaving the known world. His weapon of choice? The powerful magic Lantern of Dern Blackhammer. If he gets it, he can make himself king of the realm, and bend all to his will. It's Ford's job to make sure that doesn't happen. A fun sword-n-sorcery fantasy story that hits the ground running righ A classic epic tale of adventure with a hint of Tolkien and Conan Doyle. Set in a 19th Century environment where the technology is magic, steam, and water based, our heroes pursue a wizard who is bent on enslaving the known world. His weapon of choice? The powerful magic Lantern of Dern Blackhammer. If he gets it, he can make himself king of the realm, and bend all to his will. It's Ford's job to make sure that doesn't happen. A fun sword-n-sorcery fantasy story that hits the ground running right out of the gate. Recommended. Triumphant story of an unlikely band of misfits (well some misfits) conquering evil. I got drawn in as soon as I opened it. Great read. The city state of Moore conducts a cold war of espionage to further their interests. The average citizen enjoys the theater, a carriage ride, or a walk in the park, all the while evil strives to undo the status quo. Ford must lay hands on an ancient relic that could spell the doom of his city and possibly the world. The problem? Raven Hill, an ambitious mage has eyes for the relic and all the power it will imbue him with. Ford races against time, the elements and fate to keep the single most pow The city state of Moore conducts a cold war of espionage to further their interests. The average citizen enjoys the theater, a carriage ride, or a walk in the park, all the while evil strives to undo the status quo. Ford must lay hands on an ancient relic that could spell the doom of his city and possibly the world. The problem? Raven Hill, an ambitious mage has eyes for the relic and all the power it will imbue him with. Ford races against time, the elements and fate to keep the single most powerful magical device he knows from falling into the hands of a mad man. If he fails, Ford’s beloved city of Moore, the race of elves, dwarves, and men will bow down to one man who wishes to be a god. 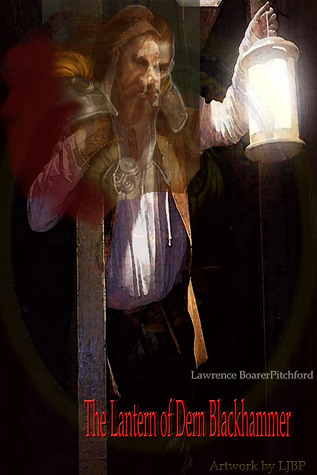 The Lantern of Dern Blackhammer is an epic fantasy with all of the expected factors of the genre, magic, different races, a quest for an important item, and an evil being that seeks to rule the world. While many of these factors may seem formulaic, it is the development of the stories characters that brings this book to life. Epic does not begin to explain BoarerPitchford’s world. From the beginning you will find some fantastical races that you are used to, such as elves and dwarves, but then you are introduced to entirely new beings that can shapeshift and do incredible things. The characters in this novel are what makes this story glow in the midst of countless attempts to create a story off of the famed Dungeons and Dragons type scenario. While each character starts off in their own world, with their own struggles and personal battles, they are inevitably brought together to form a rag tag band of brothers that stem from commoners to princes. The meat of the book will catapult you into countless realms. The quest is simple, to find The Lantern of Dern Blackhammer, but it will not be an easy feat. Rich settings, banter, and obstacles add to the beauty of this book. Five stars for The Lantern of Dern Blackhammer. This book is recommended to anyone that loves an epic fantasy that will surely take you to an enchanted place that you will sorely miss once the story is done. Well done, Lawrence BoarerPitchford. Within the fiery crucible of the abyss of time I was conceived. From that sticky, and unwashed oblivion emerged the man that clawed his way to the bottom rung of the ladder of life. From there, only up was the clear choice, and it is to that second rung that I pulled myself up to. Through heroic trials and burnt offerings, a muse came to mind, and with it the passion to put ink to paper. Unfortuna Within the fiery crucible of the abyss of time I was conceived. From that sticky, and unwashed oblivion emerged the man that clawed his way to the bottom rung of the ladder of life. From there, only up was the clear choice, and it is to that second rung that I pulled myself up to. Through heroic trials and burnt offerings, a muse came to mind, and with it the passion to put ink to paper. Unfortunately, skill did not follow, and again I scampered from inspiration to jarring reality, barely clinging to the rung. That's when hard work, divine intervention, and blind luck came together to shape I the lump of clay into what I think to be an author. But, it is not up to I to determine the outcome of all my hard work. It is up to the reader - for without those critical and ever hungry eyes prying over each word, my self-worth would be naught. Therefore, take this un to me, that you are the biography of the author, for it is you who will tell the tale of my success or failure.